A tree is the cause of a power outage affecting 2983 Shoreline households. 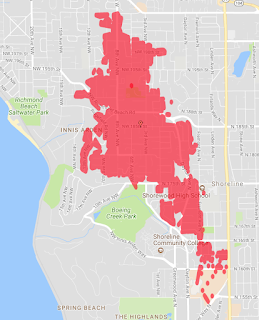 The outage was reported at 7:13am Sunday morning. Crews have been dispatched and the estimated restoration time is 10:24am. The area is centered between Aurora and the water and stretches from 155th to 205th. UPDATE: Power has been restored. Two new outages have been reported, one at a business at Aurora Square, and one affecting 10 customers on Dayton in the 180xx block.